Focaccia is a type of bread (that we adore). We adore it so much, in fact, that it took our family three tries before we were able to take a picture of it without eating it first. True story. Is there any bread under there? 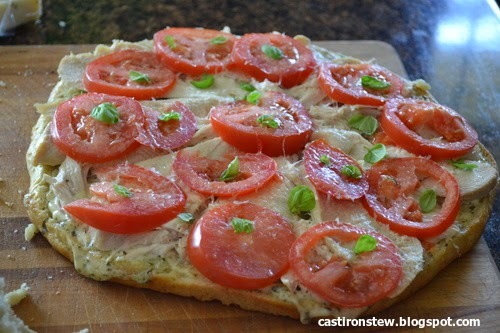 If you didn't know what Focaccia was, you might have thought it was a sandwich. So, we tried again. The second time we made it for this blog specifically. I knew I wanted to do a post on this bread, so we really tried. We really, really tried. The bread came out of the oven, and when I came back in the room the whole top of the bread was chopped off and ready for some pesto. It was like a sad little mushroom run over by a lawn mower, ya' know? The top was gone, and it didn't look quite the same. The third time we made it in the middle of the day. It was neither lunch or dinner time, and we succeeded! Mix the water and the yeast together in a large bowl. Add the olive oil, pepper, and salt. Then, stir in 1 cup of the flour until it is well incorporated. Add the flour (1/2 a cup at a time) until you form a dough ball that is soft and sticky. The dough ball does not have to be completely smooth. Move your dough ball into a large, oiled bowl. Cover the bowl with plastic wrap and let the dough rise in a warm place for about 45 minutes, or until it has doubled in volume. Do not punch down the dough. Lightly oil a 15x10x1 inch baking sheet. Slide the dough out of the bowl and onto the baking sheet. Gently pull and stretch the dough until it covers most of the baking sheet. Do not knead or punch down the dough. 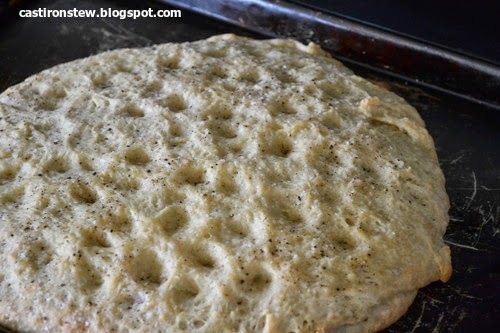 Press your fingertips on the top of the dough to form pretty and "rustic" indentations. 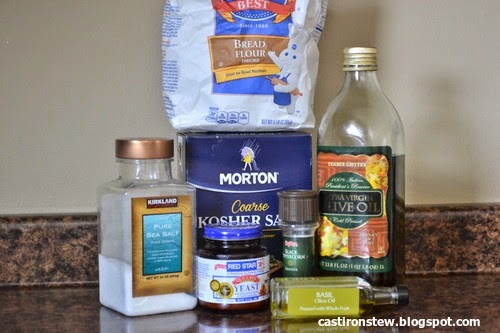 Brush the top of the dough with olive oil or another oil of your choice. We like using basil oil. Cover the top of the pan with plastic wrap and let it rise in a warm place for about 15 minutes, or until the dough is puffed up. Preheat the oven to 450. Bake the bread (on the middle rack in the center of your oven) until it is a deep, golden brown, or about 30 minutes. Let it cool, and then eat it!